Last week we introduced this very hairy passage, but we didn’t get into any of the particulars. We took the occasion to observe why the passage was so difficult and why it’s important to seriously struggle with the difficult texts. We need to truly submit our minds to the authority of Scripture, and it is precisely the weird texts that make this happen. This week, then, we will dig in to the specifics. As we’ll see in a moment, the Apostle Paul is telling the women in Corinth to wear some sort of headcovering when they engage in public prayer and prophesy. Now, it’s important to point out that this isn’t a passage about what women should wear at all times and in all places. This text is specifically about what to do in worship, particularly what to do when publicly speaking in worship. And Paul says that women should cover their heads when they speak out in prayer or when they prophesy. We are going to spend a little time on what this looked like in the 1st century, and we are going to look at Paul’s rationale. As we will see, he makes an argument that people should respect their roles of “man” and “woman.” Paul appeals to creation and to nature as the reason for the practice. We will take a look at the major views of this passage, and, then I will give you some thoughts on how we should apply it today. Let’s take a look. Paul writes, “Every man praying or prophesying, having his head covered, dishonors his head. But every woman who prays or prophesies with her head uncovered dishonors her head” (1 Cor. 11:4-5). Then he goes on to explain why. He says that an uncovered head is more or less equivalent to a “shaved” head, and he suggests that a shaved head is “shameful” (vs. 6). Since that is the case, he says that women should cover their heads while praying and prophesying. What’s this all about? There are at least five different interpretations of this passage. I will summarize them briefly, and then I will explain which one I think is the best and most natural way to read the passage. The five interpretations are these: 1) Yes, women should wear headcoverings as a rule, even today; 2) No, women do not need to wear headcoverings today because Paul is only talking about a specific custom of the day and is not giving a command to all people for all times; 3) The “covering” Paul speaks of is actually the woman’s long hair; 4) Paul is talking about a literal headcovering, but he is using it as an argument against women leading in worship; and 5) Paul is talking about a literal headcovering and he is using it as a means to maintain good order in the church. The first interpretation appeals to the surface reading of the text. Paul tells women to cover their heads, and so they should do that. This is a command based on gender roles and the proper way to adorn yourself. This view is very simple, and it is practiced by many Amish and Mennonites, some primitive Baptists, some traditionalist Presbyterians, and some traditionalists Roman Catholics. Later variations of this view allowed for hats as an appropriate headcovering, and so the famous “church lady hats” are a sort of continuing testimony to this practice. We should admit that this view is the simplest one and seems to be the easiest to defend. However, it doesn’t pay much attention to some of the key terms that Paul uses, especially the fact that Paul is defending a “tradition” (vs. 2), that he makes his argument based upon shared notions of honor and shame (vs. 5-6), and that he is guarding against “contentiousness” (vs. 16). It also doesn’t seem to care about the charismatic context. If these factors have changed in important ways, then Paul’s rationale might no longer work in quite the same way. The second interpretation is basically the exact opposite of the first. It says that this passage is simply telling us about cultural practices and assumptions in the first century. Women all wore headcoverings back then, and so Paul is telling them to go along with it. This view would say that there is nothing in this text which says that all Christians have to do this in later periods in history. It’s simply something that used to go on. Now, that view is actually easy to understand as well. After all, we should admit that there is a lot of strange stuff in the Bible, and we don’t do all of it today. But we need to be careful. We can’t say that it was wrong, since Paul endorses it. Also, notice that Paul bases the practice on “headship,” as well as the relationship between men and women, according to the way that God created them. Verses 8 and 9 appeal to the creation of humanity, and then verse 10 says, “For this reason the woman ought to have authority on her head.” This is more than just culture. The headcoverings are sending a message about the way God wants things to be. We can’t toss out that principle, so let’s not reactively reject these verses. We need to do something with them. To make things more difficult, the best historical research shows that it actually was not the cultural norm for women to wear ceremonial headcoverings in worship. There was a great deal of diversity in the Roman Empire at the time. The best evidence suggests that men and women both covered their heads during worship services in the western “Latin” parts of the Roman Empire, neither men nor women covered their heads in the “Greek” parts, and only women covered their heads in the Middle-Eastern parts, including Jewish communities. 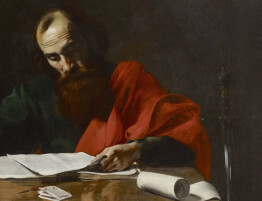 This means that if Paul was simply talking about respecting pre-existing cultural norms, then he would actually be privileging a uniquely Jewish custom over and against the dominant custom of Corinth. But that’s totally contrary to Paul’s whole missionary philosophy. He has already told us that he makes himself like a Jew when around Jews and a Greek when around Greeks. He doesn’t want any one group to impose on the other. So, what we see happening in 1 Cor. 11 is not just an observation about customs. Instead, Paul is making a theological argument that we should present ourselves in a certain way on purpose. So we have to deal with that. The third interpretation is quite interesting. It argues that the women’s hair is itself the headcovering. This idea comes from verse 15, “for her hair is given to her as a covering.” The argument is that this verse is a sort of key for the entire section. Just substitute “long hair” for “cover their head” in the early passages, and it all makes sense. This would be a rather neat solution to an otherwise uncomfortable text. Those who hold this view conclude that the text is commanding women to wear their hair long so as to “look like women.” Thus, the passage is primarily about maintaining proper gender roles and appearances. As long as women have long hair, they already have their heads covered. Unfortunately, this interpretation also runs into problems with the text. To begin with, the word for “covering” in verse 15 is not the same word as the word used in verses 4, 6, and 7. The words are similar but not the same. This would then indicate that Paul is making a parallel between them but not an outright identification. Also, verse 6 appears to be an insurmountable problem for this view. There Paul says, “If a woman is not covered, let her also be shorn. But if it is shameful for a woman to be shorn or shaved, let her be covered.” This doesn’t make much sense if the solution is simply to have long hair. It’s a very convoluted way to make an otherwise simple point. The fourth interpretation says that Paul is talking about literal headcoverings, probably something like a shawl or a hood. It then says that what Paul is teaching us is that the headcovering is proof that women cannot lead the worship service. This argument is found in the work of Noel Weeks, a well-respected scholar, and it goes like this. In order to pray or prophesy, you would need to do so with an uncovered head. But women cannot have uncovered heads in the worship assembly. Therefore women cannot pray or prophesy in the public worship service. The take-away point for today is male leadership. This argument largely appeals to a later verse in chapter 14. In 1 Cor. 14:35, Paul says that it is “shameful for women to speak in church.” Combine this with 1 Tim. 2:11-12, where Paul says that women cannot teach or have authority over men, and you see that women are not supposed to be leading the worship service in the first place. Basically then, this third argument goes like this: To speak in the church, they would need to take off their headcovering, and that would be shameful for women to do. Therefore, women shouldn’t speak publicly in the worship service. This way of reading the text has something going for it. It does seem like Paul lays down a general rule against women speaking in church. So it would be odd for them to get to prophesy in chapter 11. But in chapter 11 it sure looks like they are prophesying. Also, why would Paul need to use such a round-about argument here when he just comes out and says it later? And even if this is what Paul is up to, it still doesn’t necessarily tell us anything about whether to continue using headcoverings in worship. It feels incomplete. The fifth way of reading this text is to say that yes, Paul is telling the women in Corinth to wear literal headcoverings, but that this is limited to when they charismatically pray and prophesy in church. This view acknowledges the basic rule that women ought to keep silent in church, but then it says that the women in Corinth were receiving special charismatic gifts which seemed to be violating that rule. So the headcoverings were used as way to preserve the principle of good order in a very unusual context. Remember, this is Corinth we are talking about. Chapter 14 is going to discuss these special spiritual gifts in more detail. Paul will say, “desire spiritual gifts, but especially that you may prophesy” (1 Cor. 14:1). He even says that prophesying is better than speaking in tongues (1 Cor. 14:5). And we know from other passages in the New Testament that both men and women were given this gift; see Acts 2:17 and Acts 21:9. The “gift of prophesy” is not necessarily predicting the future, but instead, inspired speech of “edification, exhortation, and comfort” (1 Cor. 14:6). It’s a kind of preaching, but one where the Holy Spirit gives the words to the speaker in a direct way. The “praying,” that 1 Cor. 11 talks about is paired with this, and therefore it is referring to formal leading in prayer. The fact that women are doing this is a violation of the standard order of doing things. It might seem like a sort of feminism or radical challenge to the social order. Paul sees this danger, and so he appeals to the headcovering as a way to guard against any negative ramifications of the spiritual gifts. The headcovering is a solution to a problem. He has left them a “tradition” and a “custom” that will maintain order and propriety in a potentially chaotic situation. I find this last interpretation to be the one that best explains the text. It seems to respect the context, a worship service at Corinth. After all, Paul does not just say that women must wear headcoverings all of the time. He says that they should wear them when they “pray and prophesy.” The occasion is charismatic worship. Also, this is the only place in the whole Bible where headcoverings are discussed. It doesn’t show up anywhere else, and it is not obvious that women always wore headcoverings. Also, there are examples in the Bible where men did wear headcoverings in worship, namely the high priest’s turban in the Old Testament (Ex. 39:31). So while 1 Cor. 11 isn’t merely a cultural practice, it’s also not something that was normal throughout history. So however we interpret this passage, we need to acknowledge that it is unusual. And it does seem to me that the women are praying and prophesying at Corinth. Paul appears to be responding to the fact that this is going on. What should you do about it? This is consistent with the big ideas of the rest of this section of 1 Cor. Paul has to answer questions about division and contention in the worship service. Here we have headcoverings. In a few more verses, Paul will have to talk about the Lord’s Supper. Then, after that, he will have to talk about speaking in tongues. The Corinthians had a lot of divisions in their body, and the worship service had become an occasion for confusion and even fighting. Paul is telling them what to do about that problem. And in this section, his “solution” seems to be the headcovering. It is the tool that allows women to use their charismatic gifts but also preserves good order. The headcovering makes sure that the concept of “headship” is secured. We will talk about that more next week, but Paul wants the relationship between men and women, particularly embodied within marriages, to be externally manifested. He wants things to look right. He doesn’t want anyone to think that the gospel has radically changed this arrangement, and he doesn’t want women to use their special gifts to violate good order. However, he also doesn’t want to quench the Spirit if the Spirit does give a miraculous gift, and so he uses the headcovering as a provisional way to allow for the revelation but also preserve the normal order. If a woman receives a spiritual gift, she can use it, but she must use it in the right way, respecting the order and custom of the church. What Does This Teach Us For Today? If this fifth interpretation is correct, then what does that mean for today? Should women still wear headcoverings in worship? No. They do not have to wear headcoverings in worship. The reason that they do not have to wear headcoverings in worship is because the situation has changed. We are no longer facing the same “problem” that Paul was facing. We believe that the miraculous gifts of the Spirit have ceased, and therefore we do not believe that women will be getting special words of prayer and prophesy from God. Therefore, they will not need to break the normal order that women not lead in worship or speak publicly in church (1 Cor. 14:35, 1 Tim. 2:11-12). Let’s be careful. This is not simply the old “That was then, this is now” argument. We are not saying that the headcoverings are old-fashioned or merely a cultural byproduct. They were an intentional tool to solve a problem, and they had theological reasons. It’s just that with the cessation of the spiritual gifts, the situation is no longer the same. It isn’t wrong for a woman to wear a headcovering. But she doesn’t have to. Does this leave any meaning for today then? I think that it does. There are several principles that Paul appeals to throughout, and we need to be sure to keep them in place. The first principle is good order and avoiding contention. In chapt. 14, Paul says, “God is not the author of confusion but of peace, as in all the churches of the saints” (1 Cor. 14:33). Therefore, “Let all things be done decently and in order” (1 Cor. 14:40). Our worship services should not be chaotic, and they should not be individualistic. Simply “being led by the Spirit” is not a sufficient justification to do something in worship. You have to make sure that what you are doing in worship works with everyone else and that it sends a clear and accurate message to insiders and outsiders. So, when you join a church, the burden is on you to learn what that church does and to respect their practices and traditions. This doesn’t mean that those practices and traditions can never change, but it does mean that they shouldn’t simply be overturned and thrown out. There should be very good reason to make any major change. The change should then be made by the right people, at the right time, and in the right way. We must avoid contention, fighting, and selfishness at all costs. Then thirdly, we see that the differences between the sexes should be externally manifest. This should be true of our dress and public presentation. We need to show the world who we are, and we need to show the world who God made us to be. This is much more challenging than simply “expressing ourselves” in the modern understanding of that phrase. Instead, it means that we come to understand who we are by understanding who God made us to be. We should “look” like who we are, and we need to bring our customs into conformity to God’s creational design. We will devote another sermon to this point, but a man should always present himself to the world as someone in submission to God, in authority over his house, and in humble and loving service to God’s creation mandate. Women should present themselves as those in submission to God and then their husbands, and as those called to glorify their husband and complete him in the Lord. This needs to be true inside and out, and the world should be able to see it clearly. It’s important to remember that while this section on headcoverings seems a little odd, it comes right at the end of a lengthy section on how Christians should use their liberty in Christ for the purpose of setting the needs of others above themselves. You will remember that one of our themes was that Christian liberty is the liberty to give up claimable rights in order to help others. That is the basic idea that leads to this passage, and we can see how it continues here. At the end of the day, we freely admit that these verses in 1 Cor. 11 are strange and difficult. We think our conclusion is sound, but we understand that there is much disagreement. We shouldn’t be overly dogmatic about this, and we don’t want to miss the forest for the trees. If we find ourselves bristling under the weight of these verses, let’s remember that overarching call for us to find joy and fulfillment in glorifying God. We should be able to sacrifice our own desires for the sake of the gospel because of the gospel. We should be able to do this because of what the gospel is. God love us so much that He chose to find a way to pay what we owed, to fulfill the law that we had broken, even at His own expense. He loved us so much that while we were yet sinners, Christ died for the ungodly. And that is the reason that we must have gratitude and return the example of self-giving. We must do this to show the light of Christ. Click HERE for an extra handout exploring the meaning of “angels” in vs. 10.